As every parent knows, when you have kids, your life is no longer your own. No matter what, you have to pick up your kids from school, take them to the doctor, feed them, clothe them, and love them - every single day, for 18+ years. 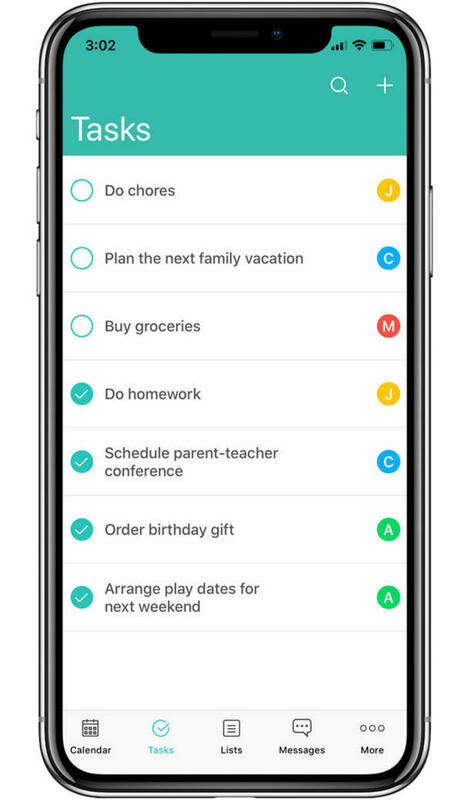 Our first app, Calroo, helps busy parents tame the chaos of their family schedule. It combines a calendar, tasks, lists and messaging in one app, and makes asking for help as simple as a swipe. Now we're building WeParent, a co-parenting app for divorced parents. 1 CEO is former exec from eBay, PayPal, UpWork (filed for IPO) and Zong (acq. for $240M), and a Stanford Ph.D. in Psychology. 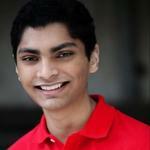 2 Featured by Forbes, Inc, Fast Company, Entrepreneur, and Huffington Post. 3 Calroo repeatedly featured in App Store, each time leading to 100x increase in downloads. 4 WeParent addresses 55M parents who live apart, but co-parent together. 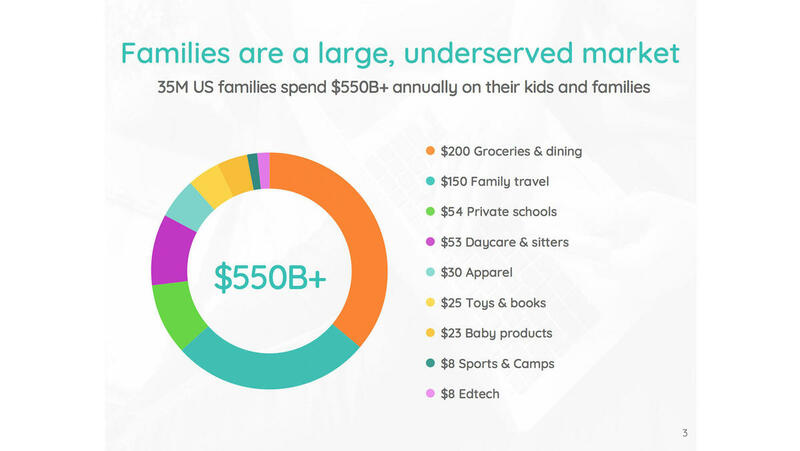 5 Families are a large and underserved market, spending $550B per year on families in the US, $1T+ globally. 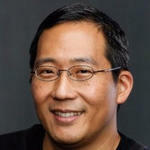 Former exec at eBay, PayPal, oDesk, Zong (acq. for $240M). Stanford Ph.D. in Psychology. Second time startup founder. 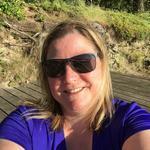 Mom of 2 awesome kids. 16 years of software &amp; mobile app development. Founded software consultancy RubyThree. Dad of 2. Former App Developer for Walmart. MS in Computer Engineering. Expert in REST-based API development. Degree in digital games development. Experienced lead developer for mobile and web platforms, hybrid and native Android apps. Ex-Microsoft product leader. 10+ years experience building high- performing teams. Mom of 2. Former senior software engineer at Apple. Key contributor to iMovie, iPhoto, Aperture. Dad. 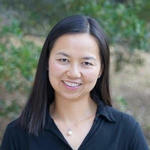 Founder, SupportPay. 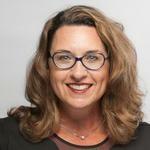 Former VP at Symantec. UC San Diego BA, San Jose State MBA. Mom. 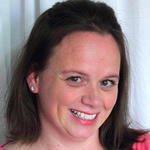 Founder of Bloggin' Mamas, a network for mom bloggers. BA in Psychology and Sociology. Mom. Ex-Google Product Manager. 20+ years of PM and engineering experience. MBA from Wharton. 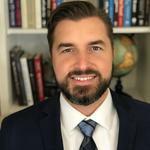 I have worked with over 100 high-growth startups over the years including multiple 9-figure exits, and I’ve developed a good sense of what it takes to succeed. I’m investing in Calroo because of the founders' 100% commitment to solving the collaboration problem for their own families, and for millions of others. 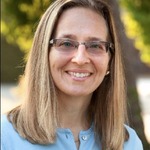 When I met Elena at the Women's Startup Lab accelerator for female founders, I was impressed both by her background (Stanford Ph.D., former eBay and PayPal exec), and by her energy, persistence and grit. Since then, she’s made tremendous progress, and I’m excited to watch her succeed (as well as profit from it!). Elena is a force of nature. She's one of the smartest, most determined and hard-working people I know. We've been friends and colleagues for more than a decade, going back to our PayPal days. I've decided to become an investor in Calroo both because I believe in its mission - turning every family into a happy, collaborative team - and most of all, because I believe in the founder. While I typically invest in digital health startups as an angel investor, I do like to invest in products that help to improve people's lives which is why I've decided to invest in Calroo. Calroo helps parents, especially women, better manage their families. With women carrying the majority of the mental load in a family, I see a huge market opportunity for this solution. Elena is determined to not only make a difference, but also build a great business. As a parenting coach, one of the biggest problems I see is stressed out moms. In my book "Parenting as a Second Language", I recommend family meetings where families look at the calendar to help everyone be aware of all the details of the family’s schedule. Calroo has taken communication about the family calendar and tasks to a whole new level. Imagine being able to hand off a task to someone else and actually letting go of it completely? You could even train your kids to put out their own requests for help when they need a ride somewhere! Calroo lets teens take personal responsibility for things and to check them off when they are done. So valuable! 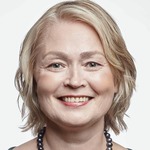 Parenting coach, best-selling author, "Parenting as a Second Language"
Terri Hanson Mead is an active angel investor and invests in early stage digital health startups, specifically FemTech and PediaTech. watched too much "How it's Made." Software engineering manager, PTA leader, Development Officer for Women on Change, mom and wife. Any parent will say that keeping track of family tasks, events, and chores is a full-time job. Calroo makes it easy. 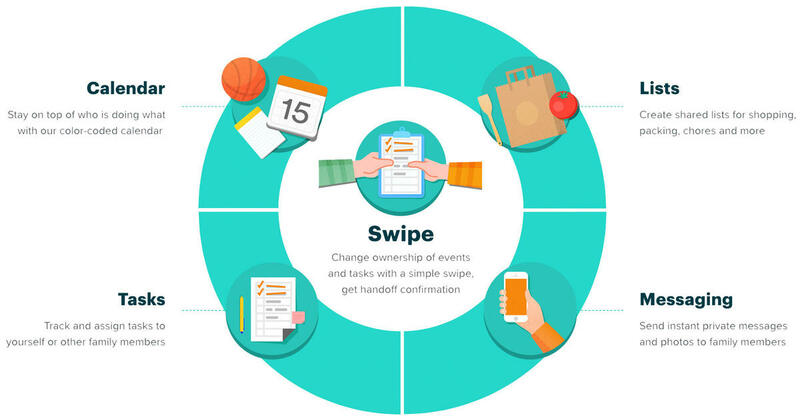 You can schedule events, hand off tasks, sync grocery lists, and get reminders all within a single app. No need to call or text to confirm: everyone in the family is always on the same page. Initially, we're focused on solving the collaboration and coordination problem for families because every family struggles with it, every single day. We ourselves got tired of having to use five different apps, plus texting, calling and emailing just to get through every day. But solving the collaboration problem is just the beginning. We will then leverage our platform to create custom apps for specific family segments – for example divorced parents. (If you think it's hard to coordinate your schedule with your spouse, try doing it with your ex!). Our next app is called WeParent, and we plan to launch it in October. If you are a divorced or separated parent and want to join our beta, please reach out. We'd love your feedback! In the next phase, we will open our APIs to other developers so that they can build their apps without having to recreate basic things like family profile and identity, calendaring, messaging, etc. Think of it as a Google sign-on, but for families. This way, when your family starts using a new app or service, you don't have to re-enter the same information (like ages and genders of your kids) over and over again. Importantly, you will always maintain full control over how your family's data are used at a very granular level. Our ultimate goal is to become a new discovery platform for family-oriented apps and services. Some of these apps will be built by us, others by third-party developers who are using our APIs. We will curate the apps and recommend them to consumers based on their unique family profile. We want to help families discover apps that they "never knew they always wanted." We want every mom, dad, and caregiver to say: finally, here's a platform built just for me. We want everyone to feel supported in their role as a parent, spouse, caregiver and family member. Join us! Experts explain how Calroo helps parents. "Calroo has taken communication about the family calendar and tasks to a new level. Calroo lets teens take personal responsibility for things and check them off when they are done. So valuable!" "Let’s be honest, if you have a couple kids in multiple activities and a partner who also works full-time, sometimes it feels like running your family is more work than running your organization." "I love that I get an explicit confirmation that another family member accepted the handoff, so that I can rest easy knowing that my son will get picked up from soccer practice." " Calroo helps you remember who is doing what, when and where — and if you have a bunch of kids in different activities, reminders make your life a whole lot easier. " Apple has featured Calroo repeatedly since then. Hired three developers, six interns, and a Head of Marketing. We've been rapidly iterating and are already on version 15 for Android. With this milestone, we'll introduce the freemium business model. Join the Family Tech Revolution! 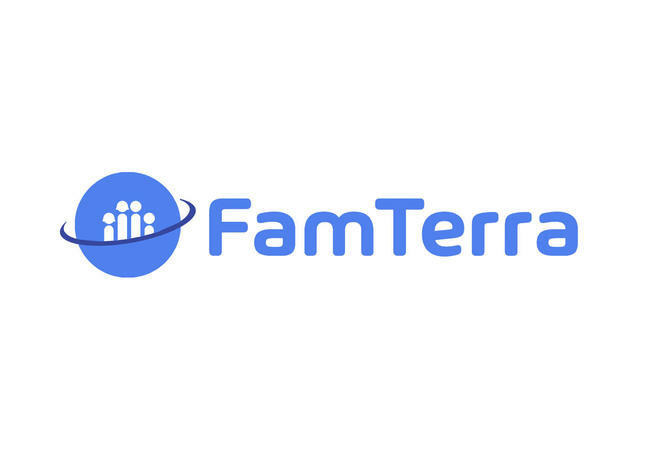 From our humble beginnings 2+ years ago, FamTerra has been built by parents, for parents. As parents, we got tired of having to adapt our lives to technology instead of technology adapting itself to us. We got tired of having to use apps and services that were designed for someone else, not for us in our roles as parents and caregivers. So we set out to build a platform that can materially improve the lives of millions (and ultimately billions) of families. We want to build a platform that will keep our family data private, that will not treat us as "eyeballs" to be monetized, and that will truly make our lives easier and our families happier. 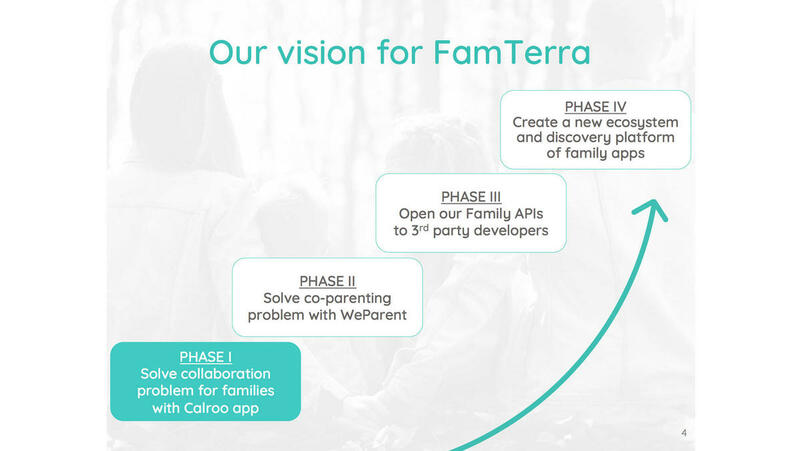 And now we want to give every parent an opportunity to become an investor and part-owner in FamTerra. You help build a revolutionary new platform for parents and families. Imagine being able to tell your kids and grandkids: I saw the potential in FamTerra before everyone else did. You support a female entrepreneur who is backed by a diverse and talented team. Women founders receive only 2% of VC funding, despite strong evidence that female-led companies and companies with diverse teams produce stronger financial returns for investors and shareholders. You help us fulfill our mission of saving marriages, and making families happier. We want to liberate parents from the never-ending logistical "busywork" so that they can spend more quality time with their families. We want to reduce the stress, guilt, and resentment that build up in daily negotiations, ruining our marriages and our happiness. We want every parent to feel like a great parent. It's a lofty aspiration, but with your support, we can do it! You get to participate in the financial upside of being an early investor in a startup. The beauty of crowdfunding is that you don't have to be a rich accredited investor with access to a secret deal flow. All you have to do is share our passion and believe in our mission. You become a part owner in FamTerra. With your investment, you're buying more than a product. You're buying part of our company. You're getting a seat at the table – and on our cap table. 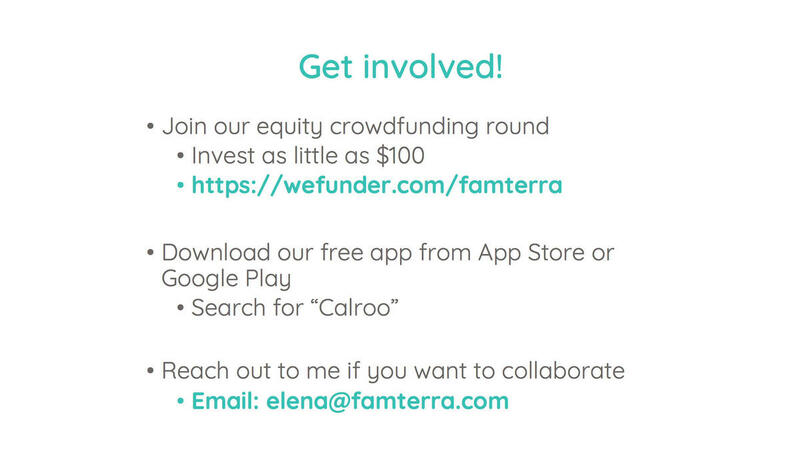 You have a voice in setting the strategy and product roadmap for FamTerra. Let us tap into your wisdom and experience. Tell us about your aspirations and your struggles. Give us your honest feedback and advice. We're building this platform for you, so we want to hear from you. You get to shape the future of family tech. Join us, and help us change the world for the better for millions of families! Annual spend on kids and families in the U.S.
Our first app, Calroo, is currently free and ad-free, keeping the focus where it belongs – on your family. Unlike other apps in the family tech space, we don't treat you as eyeballs to be monetized. We treat you the way we want to be treated ourselves – like human beings who are doing the most important job on the planet: raising good kids. In the future, we may add new features to Calroo and create a premium version of the app, called Calroo Pro. (We will always keep a free version of the app for new or casual users). In addition, we may also integrate with services such as Amazon, Care.com, grocery delivery or ride-sharing services and the like, creating a new revenue stream in the form of affiliate or transaction-based fees. Our next app, WeParent, will be a paid subscription app. To encourage new user sign-ups and referrals, we will give everyone a free month of WeParent automatically, and we will extend the free trial by one month in exchange for each successful referral. With our referral program, our most loyal users and advocates can keep using WeParent for free, for as long as they want. As we add new apps to the FamTerra portfolio, we will use business models that make sense for the use case and customer segment of each app. Some apps will be free, others will use a freemium model, yet others will charge for download or be monetized through a monthly subscription. Our goal is to serve as many families as possible through our platform, while having a sustainable business model that allows us to continue investing in delightful apps and providing excellent customer experience. Even though parents spend $550B a year on their kids in the US alone ($1T+ globally), they are under-served by technology. Initially, we're focused on solving the collaboration problem because it's something every family struggles with daily. 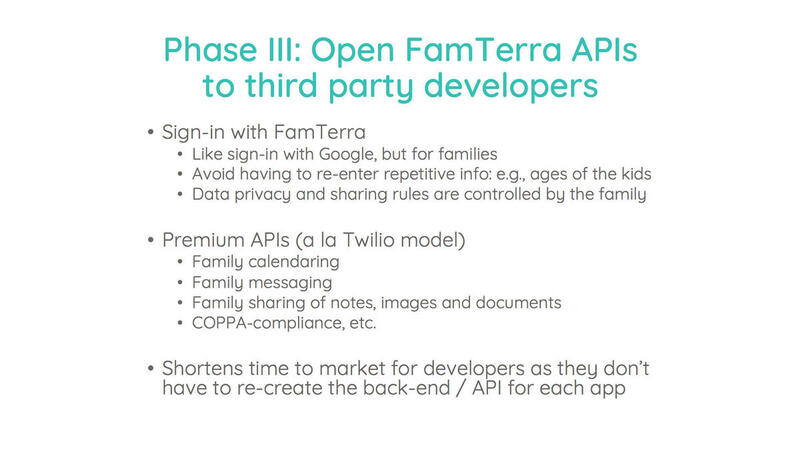 We will then build other solutions for families, and open our APIs to third-party developers. Our vision is to create a global technology platform that materially improves the lives of millions (and ultimately billions) of families. 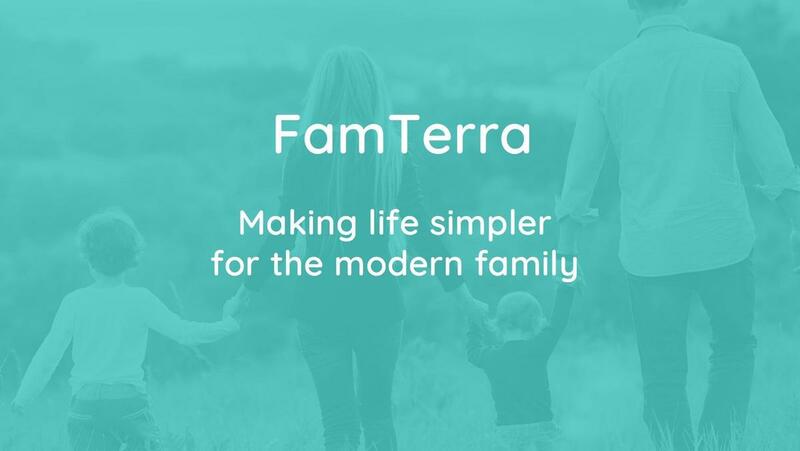 FamTerra is a technology platform created by parents, for parents. Initially, we are focusing on solving the collaboration problem - the need to coordinate and manage your family’s busy schedule with different family members and caregivers. Later on, we will expand our offering to tackle other everyday problems experienced by millions of families. Our mission is to create a technology platform that will materially improve the lives of millions (and ultimately billions) of families, and that will make every parent feel like it was built just for them. As every parent knows from personal experience, when you become a parent, your life is no longer your own. You have to pick up your kids from school, take them to the doctor when they are sick, help them with homework, clothe them, feed them, and most importantly, love them. You do it every single day, for 18+ years. You can never say: “Today, I just don’t feel like being a parent. I’ll take a day off”. It’s just not an option. The sheer amount of work we have to do as parents, family members, and caregivers is overwhelming. If not managed well, it can be damaging to our personal health and well-being. It can create stress and resentment in our marriages, as our conversations move from “tell me about everything you did today!” to “why didn’t you take out the garbage when I asked you?” Yet despite doing the most important job on the planet - raising kids - and despite spending $550B per year on kids and families (that’s in the US alone; globally the number is $1T+), families are under-served by technology. Families are forced to adapt themselves to technology, and use tools that were built for individuals or for businesses, rather than technology adapting itself to them. That’s what we want to change at FamTerra. Your first app is Calroo - where did that idea come from? My main motivation for creating Calroo came from my personal experiences as a working Mom of two awesome kids (who are now 10 and 12 years old). I’ve always tried to be a good Mom, but often felt like I was failing at it, in part because there were no good tools built for me, in my role as a Mom. When I look at my phone, I see incredible apps that I use every day, either as an individual or as a professional. But I don't see apps that I can use as a Mom. That's what we're building - an app that every Mom and Dad can use and relate to, and app that they feel was built just for them. Why can't families use Google calendar, or some other calendaring solution? I love Google calendar, and I use it all the time. And Calroo is integrated with Google calendar, so that families can continue using Google for work, but use Calroo for their family. The problem with Google calendar is that works beautifully as a personal productivity tool (for your own events and reminders), or in a professional context, but in the context of a family, it doesn't work so well. Let me explain.When I use Google calendar for work, and invite my colleagues to a meeting, it’s very clear what is expected of them: they need to show up (preferably prepared). But when I invite my husband to a “School concert”, even when he accepts, it’s actually unclear who’s doing it. Is he going, so I don’t have to? Am I going, so he doesn’t have to, and I’m just informing him? Are we both going? Or is it just an FYI for both of us? It’s ambiguous.So what we did at Calroo is disambiguate that handoff of responsibilities. When you swipe an event or task, and hand it off to your spouse, nanny or another family member, and they accept, you get a clear confirmation that it will get done, and that now they are in charge. The monkey (or in this case, the kangaroo) is off your back. Tell me more about your team. Why do you think you'll succeed where others have struggled? 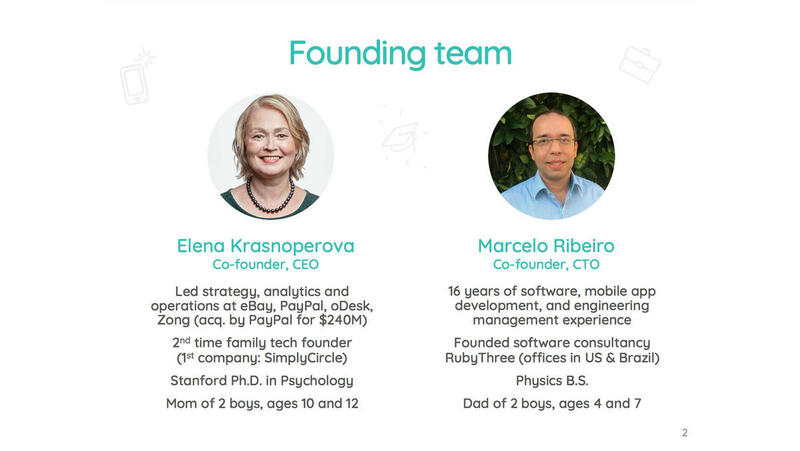 Both my co-founder and I are parents (my kids are 10 and 12, Marcelo's are 4 and 7). So we're 100% committed to solving this problem, because we live this problem every day. We will not stop until we figure this out. 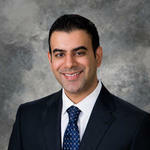 Marcelo is a versatile, experienced technologist and engineering manager. I think he's never met a technology platform he didn't like or couldn't master. He's one of those amazing 10x developers who produces extraordinary quality and quantity of work in a short amount of time. 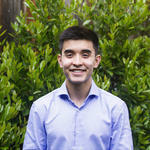 We have 3 fully dedicated engineers on our team, in addition to Marcelo. As for me, I’ve been in the family tech space for 4+ years (FamTerra is the second company that I founded). As a former executive at eBay, PayPal and oDesk (now Upwork), I know the power of a global platform. But they all started small, in a specific segment of the market - eBay started with collectibles, PayPal with serving eBay Powersellers, and oDesk with IT and engineering. Starting small and focused is one of the lessons I took from that experience. Finally, as a Stanford Ph.D. in Psychology, I have the knowledge and experience to build a family tech platform that is not only intelligent in a data-driven way, but also in an emotionally intelligent way. 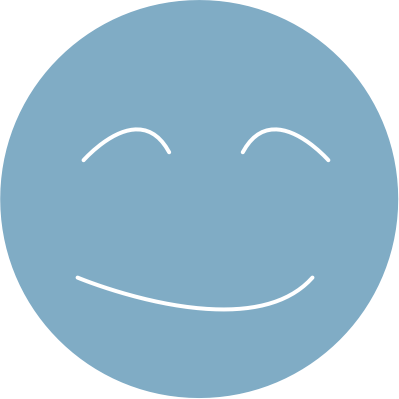 We want to help our customers not only be more productive and organized, but also happier. We’re leveraging psychology research and expert advice from parenting coaches, marriage counselors and family psychologists to gently nudge families to develop healthier family habits and rituals. So is FamTerra just an app? Or is there a bigger picture here? Initially, yes, we're "just" an app - one that focuses on solving the collaboration and coordination problem for families. But solving the collaboration problem is just the beginning. 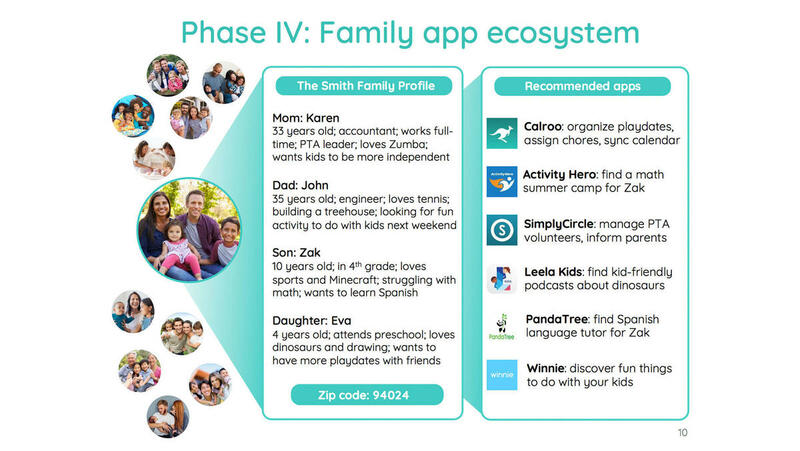 We will then leverage our platform to create custom apps for specific family segments, for example divorced parents. (If you think it's hard to coordinate your schedule with your spouse, try doing it with your ex!). We will also build new apps for families to solve other problems that they have - such as the need to manage your child's use of devices, Internet, and social media. In the next phase, we will open our APIs to other developers so that they can build their apps without having to recreate basic things like family profile and identity, calendaring, messaging, etc. Think of it as a Google sign-on, but for families. This way, when your family starts using a new app or service, you don't have to re-enter the same information (like ages and genders of your kids) over and over again. Importantly, you will always maintain full control over how your family data are used, at a very granular level. Our ultimate goal is to become a new discovery platform for family-oriented apps and services. Some of these apps will be built by us, others by third-party developers who are using our APIs. We will curate the apps and recommend them to consumers based on their unique family profile. We want to help families discover apps that they "never knew they always wanted." We want every mom, dad, and caregiver to say: finally, here's a platform built just for me. We want everyone to feel supported in their role as a parent, spouse, caregiver and family member. We hope you'll join us on this journey! FamTerra has financial statements ending February 11 2020. Our cash in hand is $17,110, as of December 2018. Over the three months prior, revenues averaged $0/month, cost of goods sold has averaged $0/month, and operational expenses have averaged $10,000/month. As every parent knows, when you have kids, your life is no longer your own. No matter what, you have to pick up your kids from school, take them to the doctor, feed them, clothe them, and love them - every single day, for 18+ years. 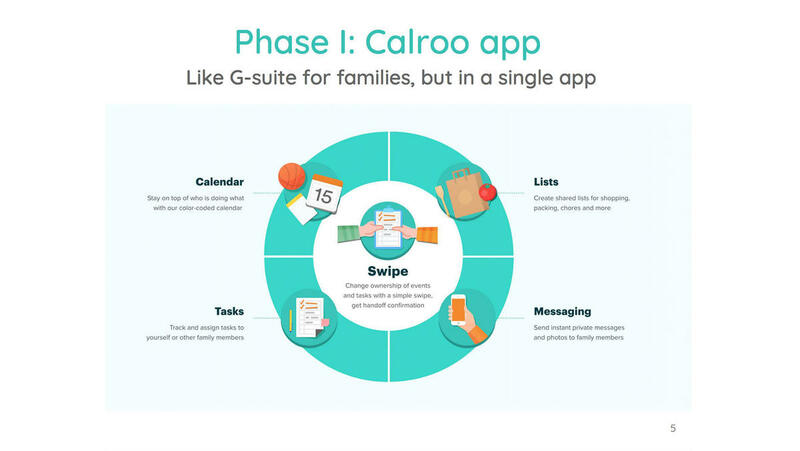 Our first app, Calroo, helps busy parents tame the chaos of their family schedule. It combines a calendar, tasks, lists and messaging in one app, and makes asking for help as simple as a swipe. Our latest app, WeParent, is a co-parenting app for divorced parents. WeParent helps them manage custody schedules and other logistics with each other. 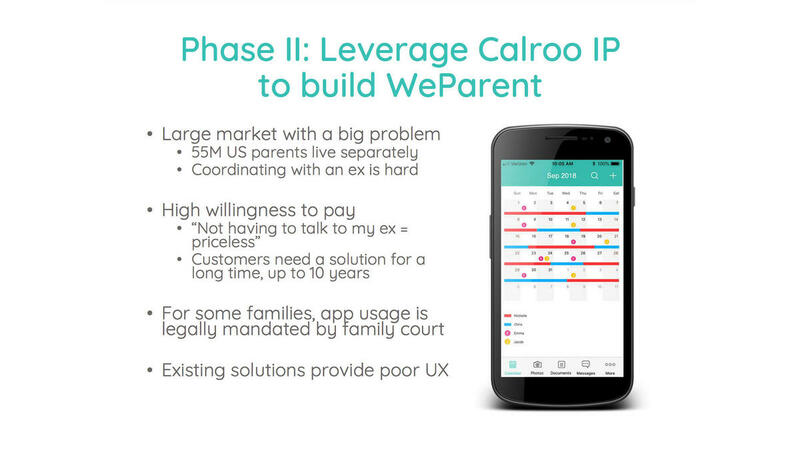 In the summer of 2019, we plan to expand the WeParent target market from just divorced parents to all families, migrate Calroo customers to WeParent, and ultimately to sunset Calroo. FamTerra, Inc was incorporated in the State of Delaware in September 2015. Assets. As of December 31, 2018, the Company had total assets of $17,110, including $17,110 in cash. As of December 31, 2017, the Company had $11,132 in total assets, including $11,132 in cash. Net Loss. The Company has had net losses of $196,376 and net losses of $194,571 for the fiscal years ended December 31, 2018 and December 31, 2017, respectively. Liabilities. The Company's liabilities totaled $728,107 for the fiscal year ended December 31, 2018 and $462,332 for the fiscal year ended December 31, 2017. To-date, the company has been financed with $289,000 in debt, $225,000 in deferred compensation, $50,000 in convertible notes, and $105,010 in SAFEs (via Wefunder). We plan to use the proceeds as set forth in this Form C under "Use of Funds". As of March 1, 2019 we now have subscription revenues from our customers as an additional source of capital. We will likely require additional financing in excess of the proceeds from the Offering in order to perform operations over the lifetime of the Company. We plan to raise capital in 12 months. Although capital may be available for early-stage companies, there is no guarantee that the Company will receive any investments from investors. FamTerra, Inc cash in hand is $17,110, as of December 2018. Over the last three months, revenues have averaged $0/month, cost of goods sold has averaged $0/month, and operational expenses have averaged $10,000/month, for an average burn rate of $10,000 per month. Our intent is to be profitable in 24 months. As of March 1, 2019, our new app, WeParent, is generating subscription revenues. In our first month of operation, it generated ~$3,000 in monthly revenues. We expect revenues to grow by at least 50% MoM over the next 3-6 months. Subscription revenues from our customers will be our primary source of capital going forward. As we grow our customer base and scale to thousands and ultimately millions of users, our website’s infrastructure as it relates to storage space, bandwidth, processing ability, speed and other factors may begin to deteriorate or fail completely. This may result in deteriorating user experience, system failures or system outages for continued periods of time. If we are unable to resolve any technical glitch, our business and financial conditions could suffer. In addition to needing to scale our technology platform, we will also need to scale our business operations and team to support a growing business in order to be successful. Mobile app stores are highly competitive. New competitors may emerge with a stronger product, more funding, or unique access to potential consumers. 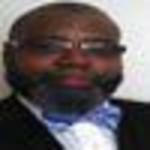 Increased competition may adversely affect our business, prospects, financial condition or results of operations. We cannot assure investors that we will be able to compete effectively against current and future competitors. Breaches of the Company's platform and systems may materially affect client adoption and subject the Company to significant negative reputational, legal or operational consequences. Calroo user privacy has never been compromised to date due to a focus on encryption and security, but 100% security cannot be guaranteed. Cyber-crimes are becoming increasingly common and aggressive which brings parallel increase in risk. The company owes a significant amount of money to two related parties, The Perrodin Family Trust and the founder and CEO Elena Krasnoperova. While the founder and CEO debt may be forgiven, if everything is repaid the total amount including interest is $549,757.81, and is set to be due on 12/31/18. The company is not prohibited from being lent more money, and if it increases its debt amount, its financial position could be harmed. The Company has limited operating history and is still pre-revenue. Accordingly, the Company’s operations are subject to all the risks inherent in the establishment of a new business enterprise, including potential operating losses. The Company has made key assumptions around its ability to acquire, retain and engage consumers, ultimately reaching meaningful scale (millions of monthly active users), customer willingness to pay for the premium version of the app (i.e., Calroo Pro), and ability to develop a set of organic (i.e., free or earned) customer acquisition channels. If all or any of these assumptions proves untrue the company may have difficulty generating or sustaining revenue in the future. 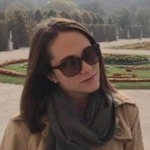 Our future success depends on the efforts of a small management team, namely the two co-founders Elena Krasnoperova and Marcelo Ribeiro, who are supported by a Head of Marketing and a technical team. The loss of their services may have an adverse effect on the company. There can be no assurance that we will be successful in attracting and retaining other personnel we require to successfully grow our business. This is a deferred salary note due to the founder, Elena Krasnoperova. It officially matures on 12/31/18 but can be forgiven / written off at the founder's discretion. 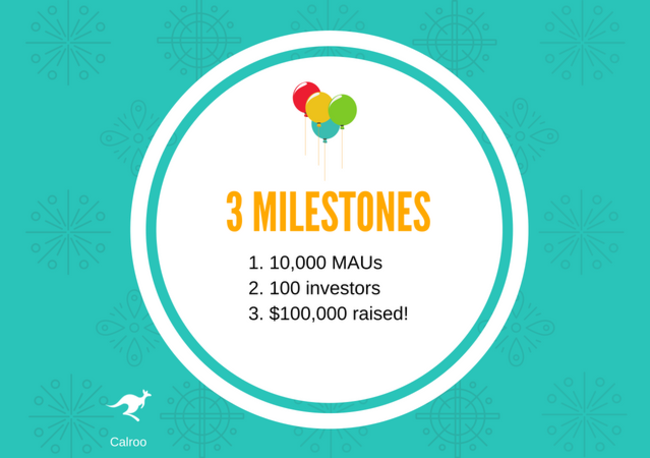 Calroo reached 3 milestones today! 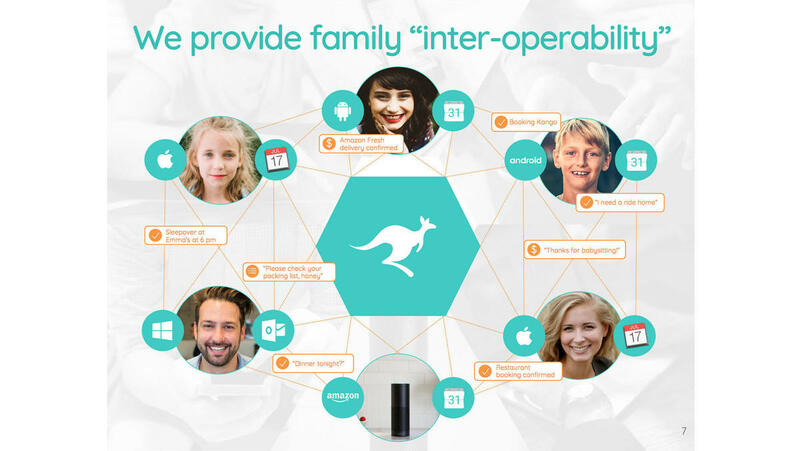 Calroo is a family organizer that puts an emphasis on permissions and collaboration. There are shared calendars and tasks, but you can also keep certain events, like a surprise birthday party, private from some members. You can also ask a family member to help you with a task or event with a single swipe, and the app makes it just as easy for them to reply (hopefully soon!). If you think running a business is hard work, try running a family! 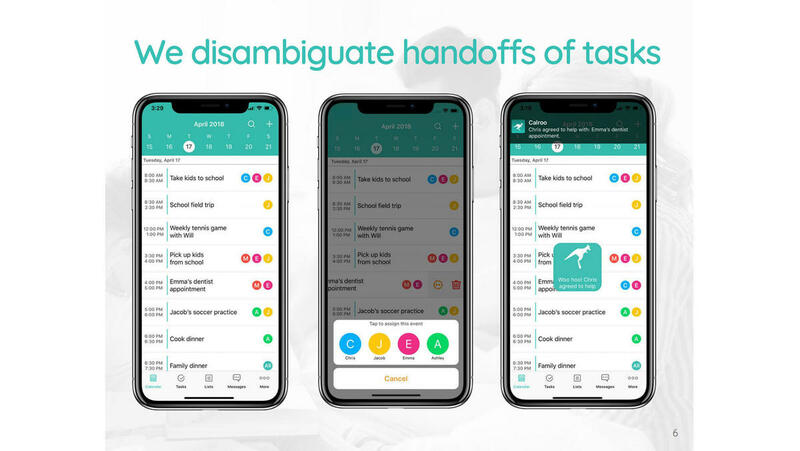 Calroo is a calendar app that helps busy parents become more productive by delegating family duties via mobile calendar. Parents can assign chores, pass along shopping lists, set alerts for when certain jobs are due and more. Think of this as a digital version of all the sticky notes left on the refrigerator as reminders. Calroo helps you remember who is doing what, when and where — and if you have a bunch of kids in different activities, reminders make your life a whole lot easier. Business owners with a busy family can also look to apps that help reduce stress and increase organization within the family unit. Because let’s be honest, if you have a couple kids in multiple activities and a partner who also works full-time, sometimes it feels like running your family is more work than running your organization. Calroo is the calendar app (with in-app messaging and a clean user experience) that you needed and wanted yesterday. It’s dedicated to helping you easily delegate family duties between parents (and older children if applicable) like chores, grocery shopping, and taking the dog to the vet. Until recently, my husband and I were using several apps, plus email and texting to keep track of all of our family events, tasks and shopping lists. Then I discovered Calroo, a new family organizer app. Now the task of managing our family’s schedule became much easier. My absolute favorite feature is the ability to ask family members for help with a simple swipe. I love that I get an explicit confirmation that they accepted the handoff, so that I can rest easy knowing that my son will get picked up from soccer practice. I really love this app so much, I became an advisor & shareholder for this company! I love Calroo family organizer and have been using it on my iPhone for the last year. Glad they are on Android now. I mostly use it for the grocery list & coordinating house chores with family members. Before I had about three other apps to manage all these tasks. Now I have all these features in one place. Highly recommended! I've been looking for the perfect family calendar app and finally found it. I've used Cozi before (even paid for Cozi Gold to make the ads go away), but this is so much better! No ads, clean interface, real-time messaging, Google calendar import, even jumping kangaroos... Love it! With our three kids, we are constantly shuttling them around. This app helps keep our busy schedule straight. I also really like the list feature – helps us coordinate what we need without lots of back-and-forth. Highly recommended for families with kids! I love this app. It’s a lifesaver for me from both micro perspective where I can easily plan days without overbooking or forgetting appointments, to macro perspective of planning next summer day-to-day, together with notes, ideas and lists of things to do and see. Love it and thanks!!! Great calendar app for our family of 4. Our kids do a ton of after-school activities, and Calroo helps us keep it all straight. I especially love the fact that my teen is using it and that I can assign him tasks! There is a growing market for this... Best wishes!!! Hello! I am looking forward to using this app! We are a family on the go with five young children, and nine dental practices between my wife and I. It always seems like there are never enough hours in the day - glad to be a part of something to bring time back to families around the world! A young banker with keen interests in stock markets, entrepreneurship and technology, such as AI, IoT and 5G. 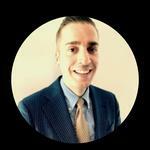 Extensive investment background, education and experience. Over 30 years of investing in stocks and bonds. Extensive investment background in stocks and bonds. Financial Institution career. MBA with a dual concentration in Finance as well as Investment Management. Hi, I'm a first time investor and love your app idea. I wish the company much success. Hi Elena, I'm Sphoorthi Yasa currently working for PayPal. I totally believe and believed in your leadership.My expertise totally comes from Analytics. Let me know if you need any help as you grow. Happy to jump in at no cost. Hello -- looking forward to your updates! Hello, my name is Louie. I just made 2 different investments of $150 towards your project. ($300 total) Im fully aware of the fact the an ROI is not guaranteed. However, if your company is as successful as we all hope, what percentage on my investment can i earn in profits ? I know theres some sort of formula where the return will depend on how well the company is doing as well as the amount i personally invested. But where can i find that information or where can i gain clarity on that ? Hello, I am a Texas Peace Officer who thinks this app will be great for many to use. Hey Elena, Marcelo: great app as a new parent eager to try it as it solves some root cause issues in theory - my background is LSSBB Operational Excellence for service and transaction, Masters Psychology and have spent most of my career in ebay in various roles. Hi Elena! I am "in". I believe in you!! You are tackling an important problem. Let me know if I can help in any other way. Technical, Product, Board Member etc. Tap for family-management apps to help your kin collaborate. You never thought juggling-a term typically reserved for circus clowns or the party trick you tried to learn in college-would be something you practice daily. Yet, as an entrepreneur, juggling is something you have to constantly practice in order for all balls, bowling pins, and rubber chickens (so to speak) of different sizes to not drop around you. If you're looking to buy anything from an apple slicer to a zero turn mower, chances are good that you'll find it (used or new) on eBay. And while you can type "entrepreneur" into the search bar and discover a plethora of pithy inspirational gear, you won't be able to find the secret sauce that's turned at least 15 women from eBay employees into successful startup founders. 6 min read Opinions expressed by Entrepreneur contributors are their own. "We can meet on Thursday at 9 a.m. at my house," suggests Elena Krasnoperova, founder of Calroo Family Organizer. I know that by then she'll have written the article we agreed to publish that day, dropped her two kids off at school and finished a phone call with her developers. It's common knowledge that apps can make life easier for people from all walks of life - business executives included. From placing orders to scheduling appointments with the press of a button, applications have the potential to cut down the time spent on small tasks and increase general productivity. Mother's Day is coming up, and it's safe to say that every mom deserves a little recognition. As difficult as it is to get an office full of employees to cooperate and work together, it's even more difficult to manage a family. Traditional companies spend anywhere from 5-10% of their annual budget on customer acquisition. Startups, however, tend to spend closer to 15-25% since they are focused on getting to revenue positive or raising a followup round based on their traction. Thanks for vouching for Elena! If you'd like to invest in Elena, please open an account. We'll waive your fees if you do it now. We asked Elena for 10 personal references. Can you vouch for Elena?